The management of hazardous materials and industrial wastes is complex, requiring a high degree of knowledge over very broad technical and legal subject areas. Hazardous wastes and materials are diverse, with compositions and properties that not only vary significantly between industries, but within industries, and indeed within the complexity of single facilities. Proper management not only requires an understanding of the numerous and complex regulations governing hazardous materials and waste streams, but an understanding and knowledge of the treatment, post-treatment, and waste minimization technologies. In fact, today's environmental manager must face working within twelve environmental management arenas, all of which may be applicable regardless of the size of the operation or business. This volume has been written as a desk reference for the Professional Hazards Manager (PHM). The PHM is a qualified environmental manager that has the responsibility of ensuring that his or her facility or division within the corporation is in compliance with environmental statutes and regulations, as well as participating in the selection of technologies and approaches to remediation, pollution control, and in implementing waste minimization practices. These decisions require knowledge and understanding of the federal, state, and local environmental regulations, a working knowledge of the best available technologies and their associated cost. This volume provides an overview of both the technology and compliance requirements that will assist environmental managers in addressing facility management of hazardous wastes, pollution control, and waste minimization. 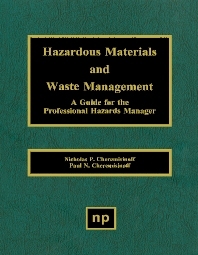 The book has been designed in part as a study guide to help prepare qualified individuals for the national certification and registration program of Professional Hazards Managers conducted by the National Association of Safety & Health Professionals and other organizations including the Hazard Materials Control Resources Institute (HMCRI) and Fairleigh Dickinson University. Hazard managers and engineers in industries which employ hazardous materials.